Human ancestors. 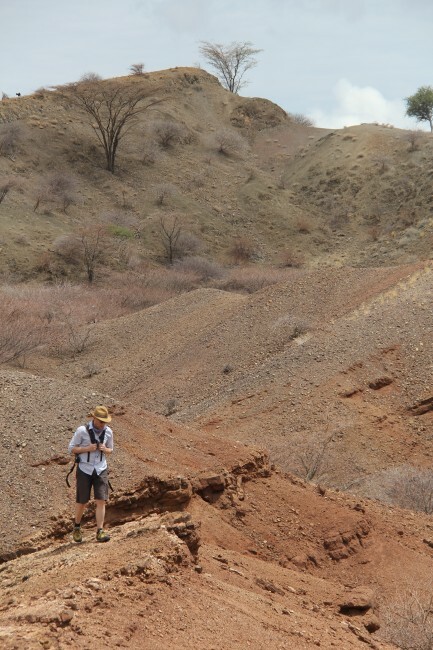 This is why the Turkana Basin is on the paleontological map. 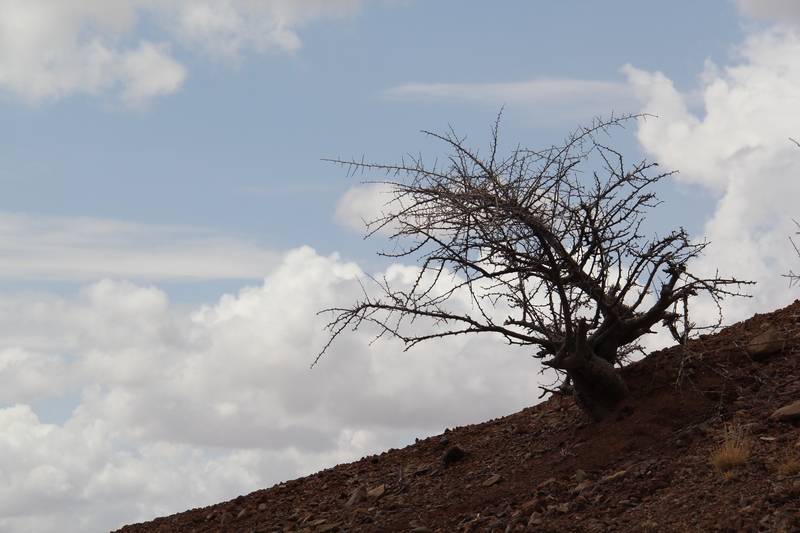 Sure it preserves an intact record of the grassland ecosystem taking over East Africa and the immigration and local radiation of bizarre and wonderful plants and animals, but it’s the human story that draws us to Turkana. It’s not an inexplicable bias. We want to know where we came from. 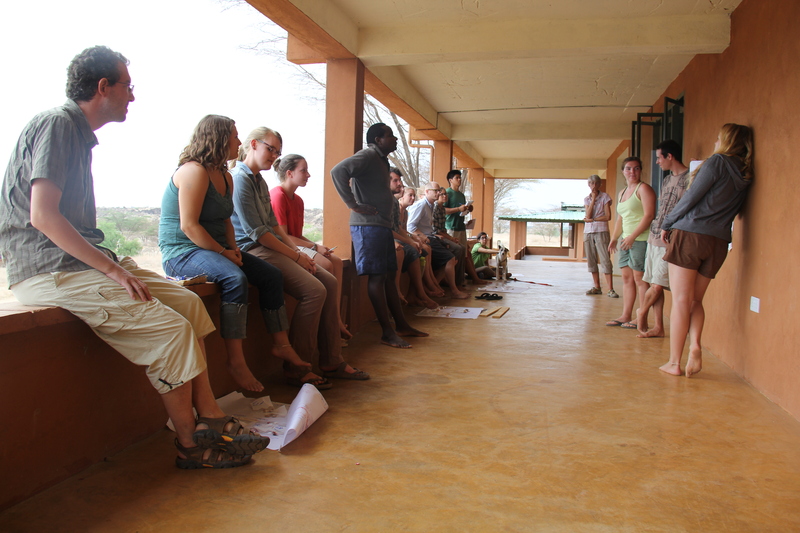 As a species we love to tell stories about each other, about family, about relatives, and if we can’t do that, we tells stories about people we know or make up stories that reveal something about our past. An evening at the student dinner table is simple proof that we love telling and hearing about where we came from. 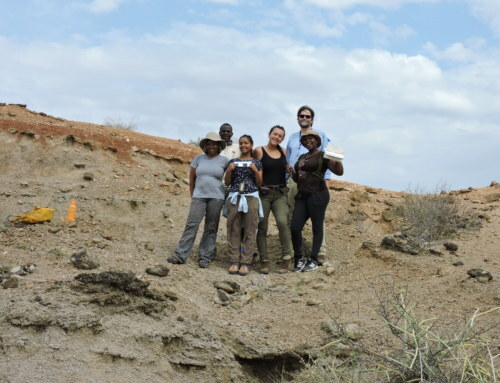 The Spring 2013 Turkana Basin Field School culminated in the Paleoanthropology module, in the story of our own origins, and Dr. Matt Skinner from the University College London would be our guide through the evidence and controversies that surround the interpretation of human evolution. Dr. Matt Skinner walks the outcrop in search of hominoids, hominids, and hominins. 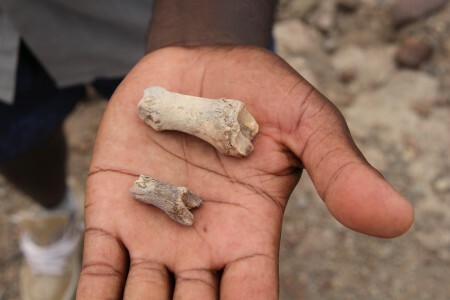 The human story starts in the Miocene, about 20 million years ago when one of the earliest fossil apes, Proconsul, was clamoring above the branches in the forests around Rusinga Island, Kenya. This tail-less primate gave rise to an expansive, bushy family tree of apes that set up shop across Africa, Asia, and Europe. Once monkeys really took off, this vast diversity of apes dwindled to the five lineages alive today: gibbons, orangutans, gorillas, chimps, and us. Arguably, apes are a radiation on the way out, a remnant of the Miocene that is barely scraping by in a monkey-dominated world. 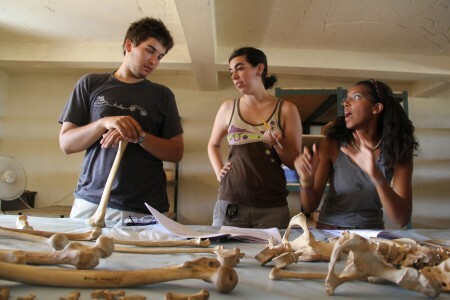 Tim, Ashley, and Ana piece together primate anatomy, one bone at a time. In order to understand the diversity of our earliest ape relatives, we had to start in the lab. Dr. Skinner set up a series of labs and experiments that would familiarize the students with the anatomical changes that characterize each lineage. 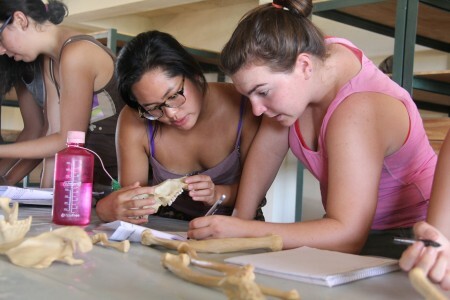 With a human skeleton, a chimp skeleton, a baboon skeleton and the skulls and teeth of Proconsul, Afropithecus, and the gorilla, the students were challenged to study the skeletal evidence to reconstruct locomotion in these different animals as well as behavior (canine size is a key indicator of social structures in primates), and diet. Holly and Leanna contemplate the baboon's social structure by studying its massive canines, a solid indicator of aggressive male-male interaction. Francis and Marcel discuss forelimb morphology...or rehearse for the TBI spring production of Hamlet. 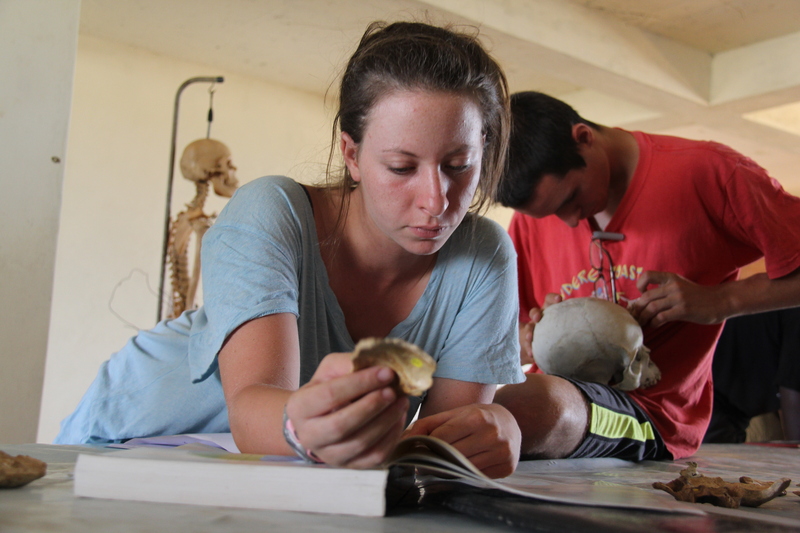 Rachel and Aaron try to sort out the complex of bones that we call a skull. Eating is a pretty important part of making a living and mammals are fortunately equipped with exquisitely complicated teeth that reveal a great deal about what they where built for chewing. Dr. Fortelius got the dental ball rolling and Dr. Skinner, a specialist in the teeth of our earliest ancestors, picked it up and led the students in a dietary exercise. 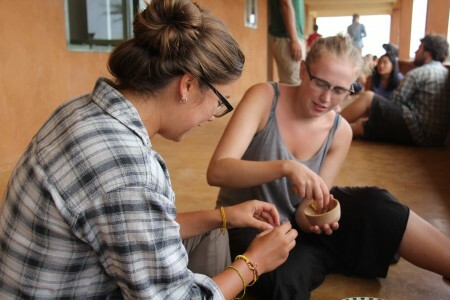 Each group was assigned a different type of food: crunchy vegetables, nuts, popcorn, root vegetables, leaves, and fruit to simulate the textures of foods that might have been encountered or exploited by early apes and early bipedal hominins. Cory and Meg mush their food with different "teeth." 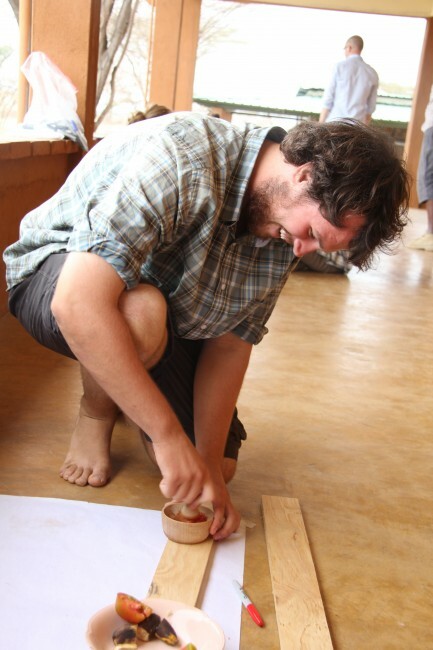 John becomes a successful hominin. His banana paste ensures he'll live to walk another day. Then different tools were passed around – a mortar and pestle, scissors, a mallet, a nutcracker – each in different sizes to simulate sexual dimorphism. 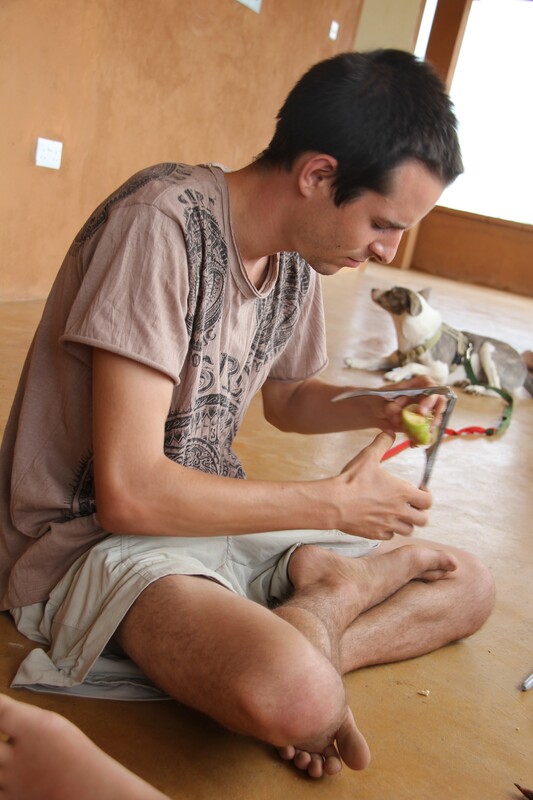 The performance of the tools was evaluated for each hominoid snack. Maybe not surprisingly, popcorn was a pretty tough food to break up, along with leaves, while the potatoes and tomatoes were pretty easy to break down using any “tooth” type. Sam never got the memo about playing with your food. Aaron unleashes his inner Paranthropus, a close relative of ours who had massive molars and chewing muscles that earned the genus the nickname "nutcracker man." 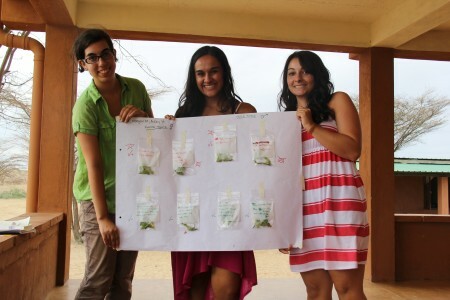 Ashley, Eve, and Maegan with a few little leaves. They discovered it's tough to make a living on the fibrous foliage. Leanna, Aaron, and Ingrid present the results of "chewing" roots and tubers with different tool types to the rest of the hungry class. 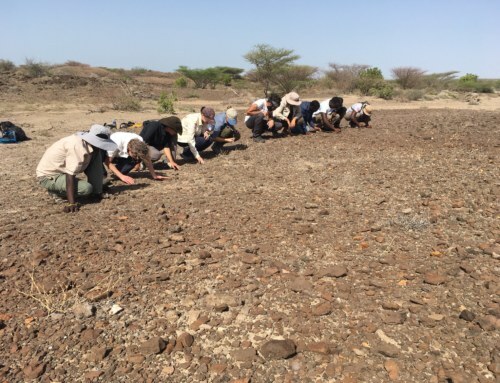 With new insight into the skeletal and dental adaptations of our earliest ape ancestors, it was time to turn our boots to the field to search for them. 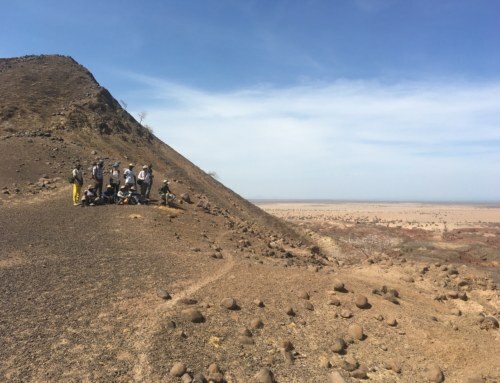 Our first paleoanthropology field trip was a double-header, first to the dipping badlands in the shadow of Mount Losodok then on to the ape-rich outcrop of Moruorot. 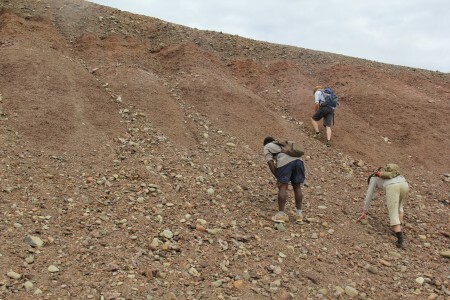 Mount Losodok over the red beds that should have a few fossils to track down. 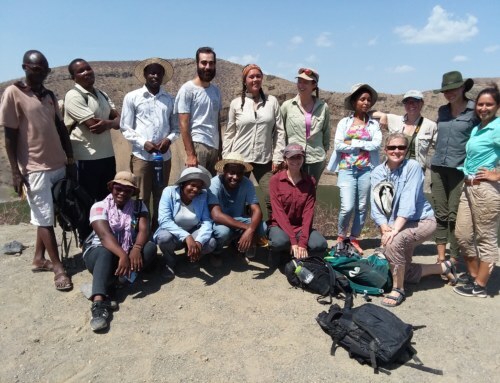 At Losodok, Dr. Meave Leakey, who has decades of experience searching for primates in the Turkana Basin, simply turned us loose. 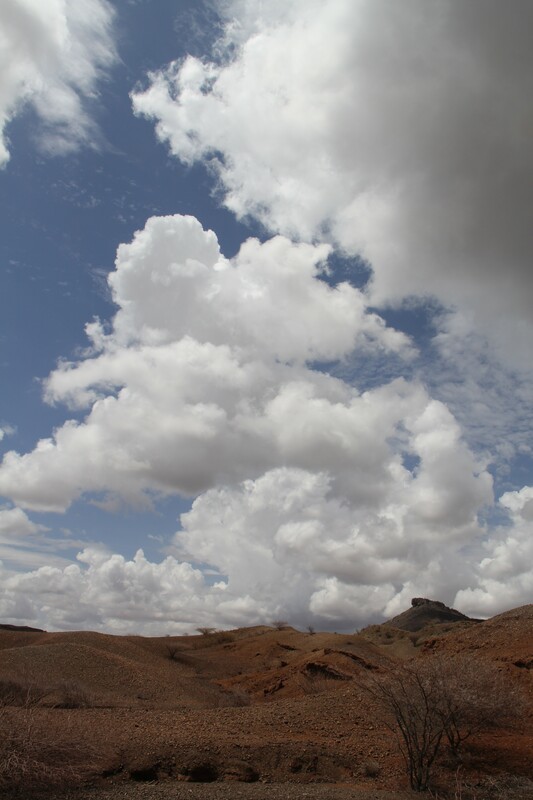 “The fossils seem to be most abundant along those red beds. Work your way down the riverbed, and we will meet back here at noon.” With that the fossil hunters were let broke free on a slow, scrupulous wander up the riverbank. With the dramatic profile of Losodok looming overhead, we searched for glimmers of enamel and chunks of bone. 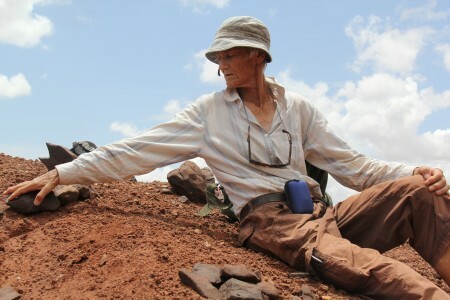 Dr. Meave Leakey inspects a deinothere tooth. 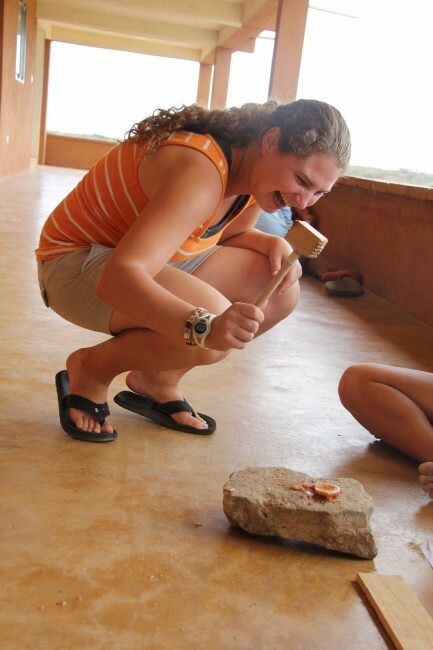 She builds a small circle of stones to mark the site for future investigation. 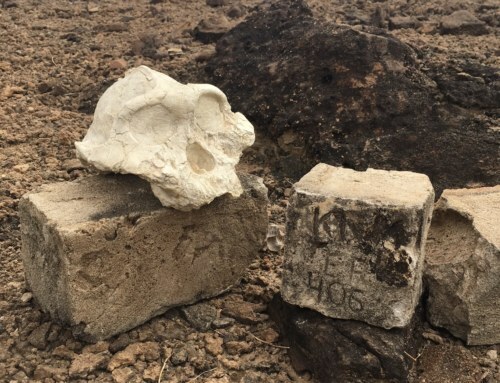 It will be worth the return trip because there's skeletal pieces to carefully remove from the hill that may be connected to the teeth. 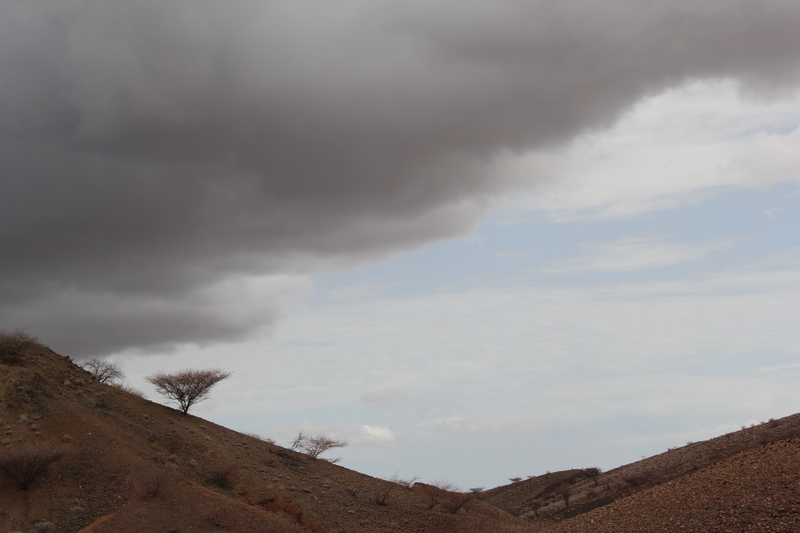 For the first time, we risked being rained off the outcrop. 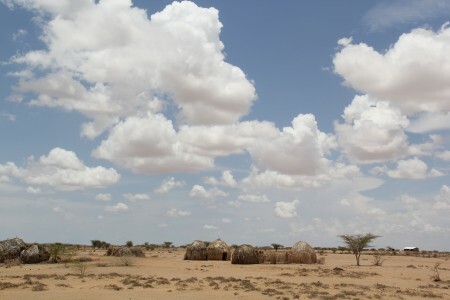 But the weather held as we finished our survey of Losodok. Francis, Dr. Skinner, and Marcel scour the gully's walls for ape, anthracotheres, and antelope. There was limited success. Francis found anthracothere teeth, the remains of the extinct ancestors of hippos while Rosie, Ingrid, and Natalie found the teeth of ancient elephants. But that was about it. We had maybe been spoiled by the abundance of material at Lothagam. An anthracothere and an elephant aren’t a bad haul for a single morning, but we did hope we would have more luck at our next stop. Between Losodok and Moruorot, the clouds gathered less ominously. 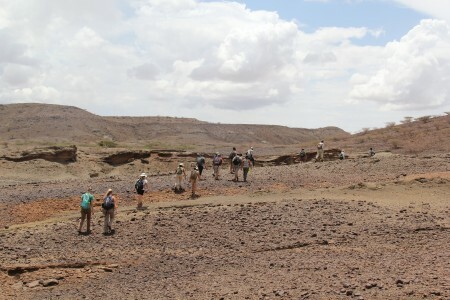 They provided a little shade as we prepared to do the slow, stooped walk of the fossil prospector at our second site of the day. Moruorot is perhaps a less dramatic setting, with a low, rounded hill rather than a butte overlooking the drainage, but the site has been worked by Dr. James Rossie of Stony Brook University for several years and has yielded ape material, including the remains of a tail-less primate the size of a Capuchin monkey (the Pirates of the Caribbean monkey). 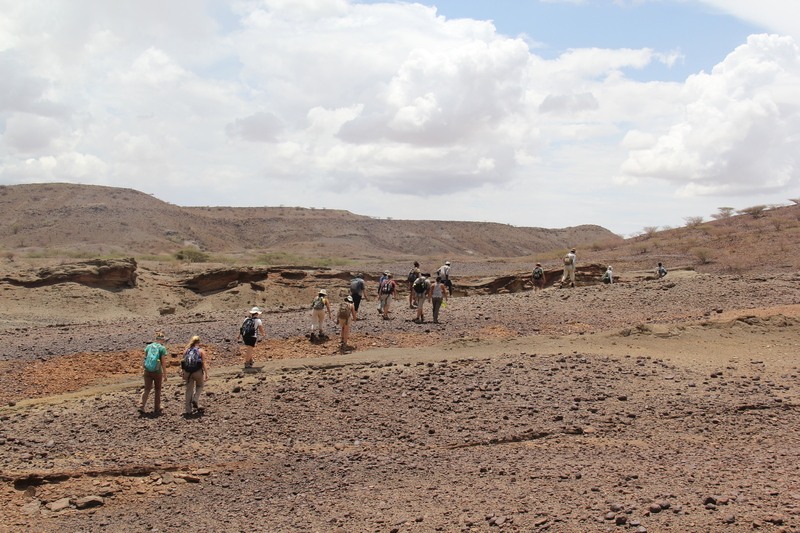 The ape site is dangerously close to a small stream bed, so we spent a few moments putting twenty pairs of hands to use building a series of dams to protect the fossils, a monumental task with the smaller crew Dr. Rossie brings into the field. 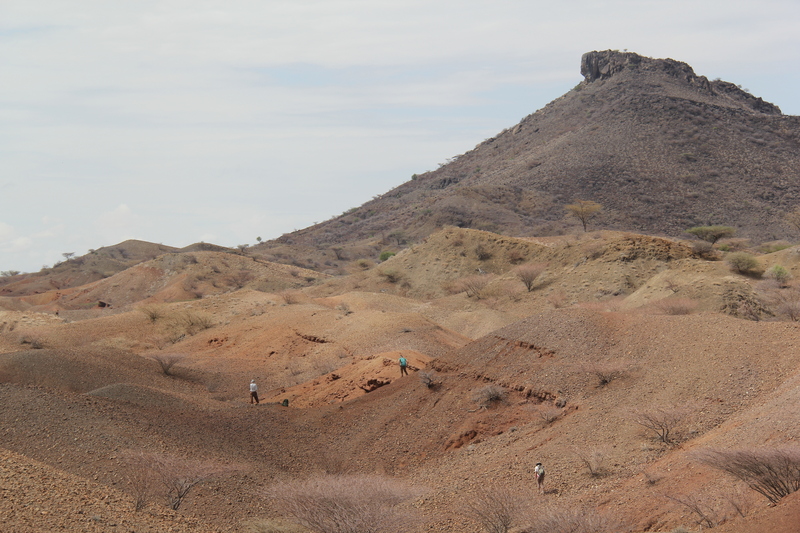 The gently dipping strata of Moruorot preserves an ancient Miocene forest populated by archaic, extinct animals like giant hyraxes and creodonts, and modern varieties like ruminant ungulates and apes. What it does not preserve is much shade. 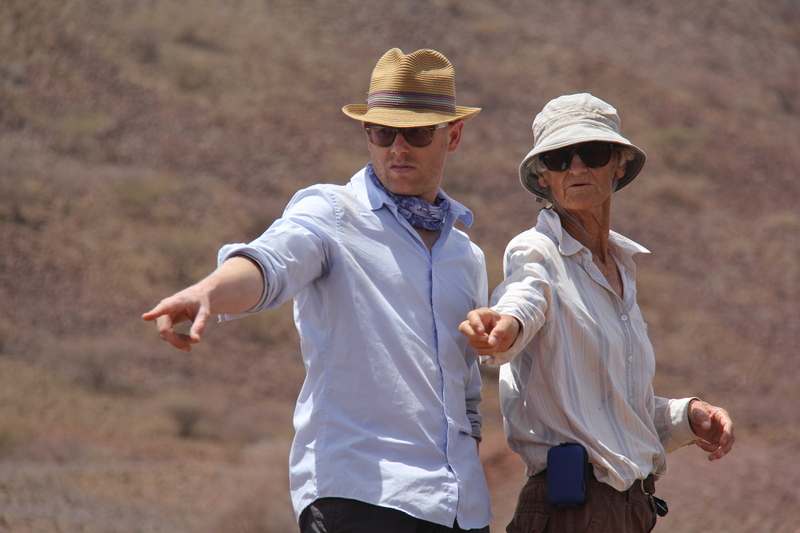 Dr. Skinner and Dr. Leakey outline the ape fossil site and try to figure out the best way to stop the site from eroding down the outcrop with the next heavy rain (such rains actually do happen). We then spread out to explore the ravine and nearby cliffs for more little ape fossils. 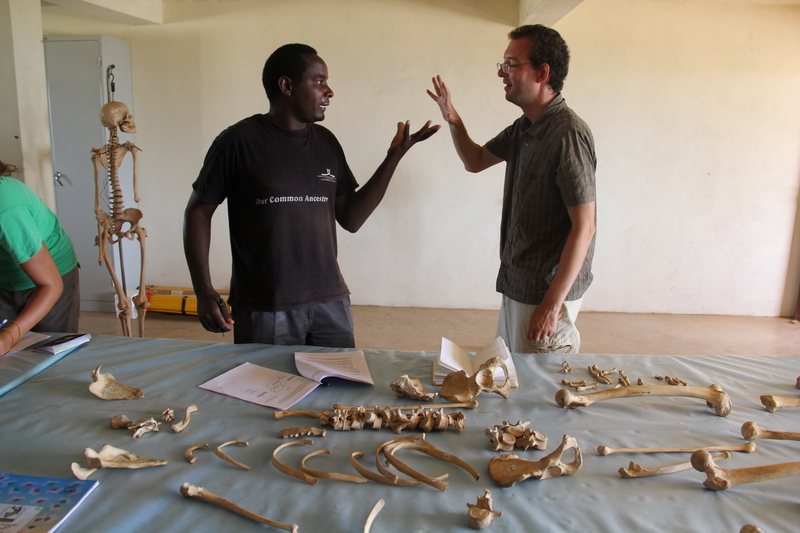 The ground was littered with the bones of living animals including goats and baboons. Below these were stone tools, calcite crystals, and below all of it: fossils. Francis has a well-trained eye and found the remains of a small ungulate called Dorcatherium, a name that sounds more like what the creature was called in middle school than an official genus. The Dorcatherium’s hip bones were in fragments along one slope and the toe bones could be found by following the drainage to the base of the gully. 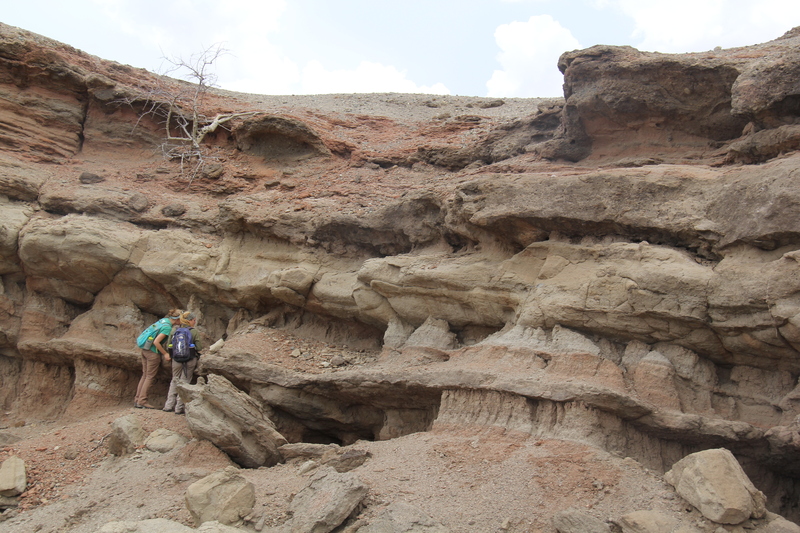 Natalie and Ingrid search the cliffs for fossils at a convenient height that doesn't require stooping. Francis with the toes of two different Dorcathere species. The extinct even-toed ungulates were relatives of the modern mouse-deer. As its name implies, the modern example is a cute, small, forest dwelling creature while it's ancient relatives got a little more ambitious. John, Rob, and Cory compare discoveries after an afternoon walking the outcrop.